The What: Extron Electronics' TLS 1025M 10-inch panel for Extron Room Scheduling systems is available immediately. The stand-alone TouchLink Scheduling panel connects directly to a variety of popular calendar services, and requires no additional scheduling software or external processors. The What Else: It features a vibrant 1280x800 capacitive edge-to-edge Gorilla Glass touchscreen that is scratch and smudge-resistant. The TLS 1025M also features the convenience of PoE, which allows it to receive power and communication over a single Ethernet cable. Two bright red and green LEDs make it easy to see if a room is occupied or available even from down the hall. The integration-friendly 1025M is an ideal solution for any environment requiring a stylish and convenient room scheduling panel, according to Extron. 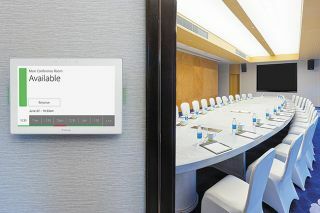 The Bottom Line: TouchLink Room Scheduling panels provide the information users need to closely analyze room usage, activity patterns, and occupancy trends across the organization. Users can download a scheduling activity file with room usage and meeting data from each touchpanel and transform this readily-available information with data analytics tools to create powerful reports.